Born on 26 May 1894 in New Westminster, British Columbia - son of George Frater and Rosamonde Watt Gibson, Vancouver, British Columbia - at the time of his enlistment in 1915: trade as McGill student, single, no current military service, previously served with the Vancouver High School cadets (two years), Presbyterian, height of 5 feet 11 inches, chest of 40 inches fully expanded, fair complexion, green eyes, medium hair. Attended Lord Roberts Public School and King Edward High School, Vancouver, British Columbia - attended McGill University College, British Columbia, from 1911 to 1915 - graduated from the University of British Columbia with a Bachelor of Arts in 1916 [sic?]. 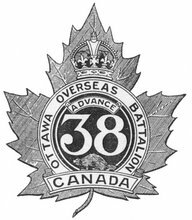 Joined the 38th Battalion, CEF, in Vancouver, British Columbia, on 5 March 1915 (number 411041) - transferred to the Princess Patricia's Canadian Light Infantry on 17 July 1915 - wounded at Ypres, Belgium, on 7 or 13 May 1916 - invalided to England - commissioned as a Lieutenant and transferred to the 58th Battalion, CEF, on 21 September 1916 - killed in action on 8 October 1916 - "last seen leading his men into action at Regina Trench on October 8, 1916. He was later reported missing and presumed dead. On November 25, 1916, he was definitely reported killed in action." - name inscribed on the Vimy Memorial, France. (Updated with a photo of Pte Gibson's inscription on the Vimy Memorial that I took in August 2012).